Now that your site is up and running, it's time to start driving traffic so you can capture some leads. We now offer a variety of marketing services to help get you started. Since every company is unique, we recommend you schedule a call to discuss your goals. This way we can provide recommendations for your specific needs. We'll work with you to define your target audience, key messages and topics. After that our writers will create content for your prospects by getting to the heart of topics they care about. Have that one-off project you've been planning to get done since...forever? The Pronto wordsmiths can turn around professional marketing communications quickly, at a price you can afford. People turn to search engines when they need to find something. Having visibility with potential clients when they're looking for you is a critical to any online strategy. If your local prospects can’t find you, you don’t exist. Pronto will get you into all the important local business directories and keep your listing fresh and up-to-date. Get customized social profiles that consistently match your branding across your entire web presence with high quality images and impactful design. Not being active on social media can look just as bad as an unprofessional profile design. We give you the foundation of a solid social presence wherever your customers are. Share some fun with your subscribers with Pronto’s unique holiday cards. We’ll customize each one to match your company’s branding, so the experience is truly personal from you to your subscribers. Email is a fantastic medium to update your subscribers about new announcements, events, promotions or product launches. 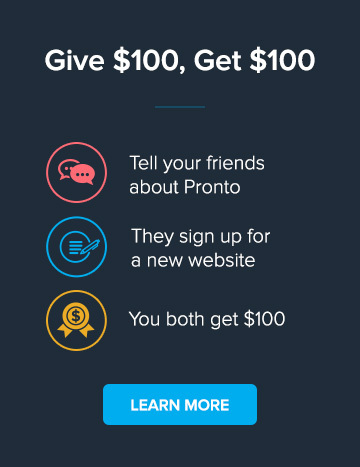 Pronto can help with the execution of copywriting, newsletter creation and delivery. Paid search is quick, scalable and easily measurable. With our AdWords Management services, we'll take care of everything so you can start earning new leads today! Retargeted advertising helps capture those potential leads that didn't convert on your website the first time around by displaying your ads only to people who have engaged with your website. Traditionally, tracing your offline conversions through their online origins has been very difficult. We make it easy to track every aspect of your Internet Presence, even when an online visitor chooses to contact you through a phone call.